The Honor View 20 is now available for pre-booking via Amazon. 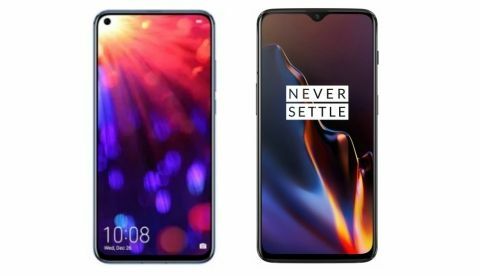 We are comparing the device with the popular flagship phone OnePlus 6T to know which one is the best when it comes to hardware? The Honor View 20 will soon be available for purchase in India via Amazon. The phone is currently available for pre-booking on the platform. The e-commerce website is also giving away free headphones of worth Rs 2,999 to those who will pre-book the phone before the sale. The smartphone will come with the Kirin 980 processor and a 48MP AI-powered rear camera. On the other hand, we have the OnePlus 6T that was launched last year with an in-display fingerprint sensor and a Qualcomm Snapdragon 845 processor. 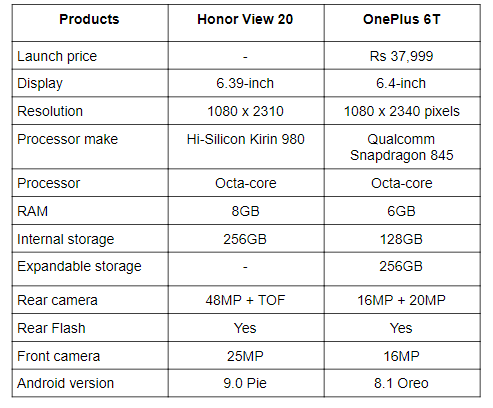 Let’s compare the two phones in order to know which device is offering the best specifications at least on paper. The Huawei View 20 sports a 6.39-inch full HD+ full view display that offers a resolution of 1080 x 2310 pixels. The almost near-bezel less display gives you a more screen-to-body ratio of 91.8%. The phone comes with a punch hole cut out at the front for a selfie camera that makes this device completely notchless. On the other hand, the OnePlus 6T features a slightly bigger 6.4-inch display that offers a better resolution of 1080 x 2340 pixels. It has a water-drop notch on top of it, which houses the front-facing camera. When it comes to the processor, the Huawei View 20 is powered by the latest Kirin 980 octa-processor, which is paired with 8GB RAM and 256GB internal memory. On the other side, the OnePlus 6T is backed by the Qualcomm Snapdragon 845 processor, which is paired with 6GB RAM and 128GB internal memory that is expandable to up to 256GB via a microSD card. Coming to the cameras, the View 20 has a 48MP AI-powered rear camera that comes with a dual NPU chipset, which can recognize hundreds of categories in real time and process up to 4500 pictures per minute. The 48MP sensor is coupled with a TOF 3D sensor. On the front, it has a 25MP unit. When it comes to the OnePlus 6T, it has a dual 16MP + 20MP rear camera along with a 16MP unit on the front. The OnePlus 6T is available in India for Rs 37,999, while you can pre-book the Huawei View 20 via Amazon from January 15.